It’s someone else’s fault. Taking responsibility for your work means not blaming others. If something that your coworker is doing is making it difficult for you to do your job, do what you can to fix the problem. Talk to your coworker or manager to see if the process can be changed, but don’t blame someone else when you don’t get your work done on time. I’m not feeling well. If you’re sick, then stay home. When you make the decision to come into work, you can’t expect to receive special treatment. If you tell your manager that you’re not performing well because of the way that you feel, they might start to wonder if you are the right person for the job. I had too much to do. Everyone is busy. If you have more work than you can handle, you are no exception. Organize your schedule and prioritize your tasks so that you complete your most important items first. If you are consistently overwhelmed with work, then you may need to communicate with your manager to see if some of your tasks can be delegated to someone else. I didn’t understand the instructions. Has your manager ever given you instructions that you didn’t understand. What did you do? Ask for clarification? Consult your coworker? Try to do the task anyway? You should never walk away from a meeting with your manager without understanding what they want you to do. They will be less annoyed with you asking them to repeat their instructions than they will be if you don’t get the job done on time. 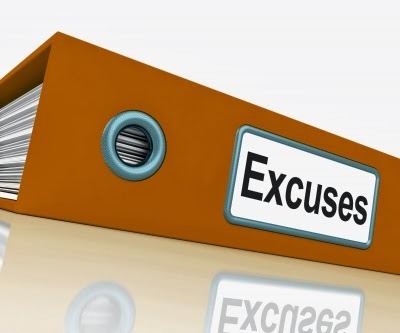 Managers hate excuses. Instead of wasting time trying to coming up with them, focus on getting your work done. However, if you do miss a deadline or make a mistake, take responsibility and move on.